Home › Drills › So, You Think You Can Float? The most basic drill I have my athletes practice is one of the most difficult skills for some swimmers to master: Floating. Floating without a buoy. Floating without any kicking to help you balance or keep you at the surface. Floating on your back. Floating on your stomach. Why must swimmers learn this skill? Because if you can float at the water’s surface without buoys or kicking, you’re doing it right. When I was new to competitive swimming, Amy Van Dyken came up to Interior AK for a swim camp. At one point, she pulled me aside and taught me how to find and press my “T” so that I could balance properly in the water. Learning something so valuable from a swimming hero who was also (at that time) the American Record holder in the 50 Free is something I’ll never forget. Your “T” is the intersection between a line drawn down your neck and across your shoulders. Finding your “T” is important because it is the key to proper body positioning and balance in the water. Many people have a difficult time floating without kicking or using buoys because their legs would rather sink than stay at the water’s surface. It is normal for a more musclebound swimmer to have a more difficult time learning to float than non musclebound swimmer. In my experience, I have seen more male athletes struggle with learning to float than female athletes and I think this has more to do with biological differences than lack of effort. A lot of people struggle with floating because their hips and legs want to sink. To correct sinking legs and hips, all the athlete has to do is press on their “T.” It is a very subtle motion, but putting pressure on your “T” (front quadrant) will correct the body position by bringing the swimmer’s legs and hips (lower quadrant) to the surface. Pressing on the swimmer’s “T” will keep the swimmer’s body at water’s surface. The swimmer will be able to float without kicking or using buoys. Swimmer’s who can’t float without kicking or using buoys will feel like they are swimming uphill. Swimming uphill will cause a lot of drag, forcing the athlete to work harder to go slower. Without proper body position, the swimmer might feel like they are swimming uphill. This is true whether they are doing freestyle or backstroke. Swimmer’s who learn how to press on their “T” will feel like they are swimming downhill, which is how a swimmer should feel in the water. A swimmer who feels like they are swimming downhill will have less drag, which means they are using less energy and swimming faster. Swimmers with correct body positioning in the water should feel like they are swimming downhill. I think that every swimmer should work on floating from time to time. 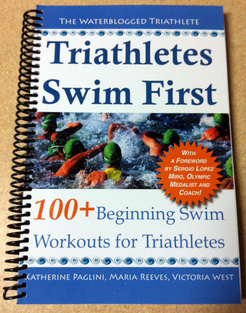 Finding the swimmer’s “T” requires the same skills whether the athlete is on their front or back. When a swimmer is new to the water, I have them practice finding their “T” on their back first because they have unrestricted access to air. It is worth spending 10 minutes at the beginning of every practice to work on proper body positioning for any athlete who feels like their lower quadrant sinks when they’re floating or swimming. Not every swimmer will be able to master this skill, but all athletes will benefit from playing around with their body position in the water. I encourage swimmers to practice floating in a streamline position, but they can also do it with their arms straight in front of them or glued to their side. If the athlete has a training partner they can trust, they can ask them to place one hand on their “T” and the other hand below their quads (stomach floating) or hamstrings (back floating) while they practice finding their proper body position. The swimmer practicing floating should try and push downward on the hand under their “T” while the training partner simultaneously removes pressure from the hand supporting their legs. Next, the floating swimmer should try to maintain their body position as their training partner removes their other hand. In my opinion, it is not floating unless you can hold your entire body at the water’s surface for an extended period of time without kicking. I should also note that it will be easier for the swimmer to learn how to float in salt water versus fresh water. Excellent post and very timely for me. 🙂 Thank you. I’ll be honest, I’ve been wanting to write this entry for awhile but I haven’t been able to get any photographs to go along with it – and it is one of those things that helps to have a visual. I came across your blog and thought, “Well… I could draw little stick men” and still get my point across. Thanks for giving me the motivation to get this entry out! Great post. This is one of the first things you are told to learn in the Total Immersion school of swimming. I often practice this as I find myself losing some buoyancy as I have lost weight. Thanks! Sounds like Total Immersion knows what they’re doing 😉 Floating is definitely one of those basic skills that can be really tough to learn. It is funny because you’d think anyone who can swim can also float but it isn’t always the case when you take away their forward momentum. I wonder if you’ll find a balance point where it will be easy for you to feel the water and float no matter how much weight you lose or if it is something you will always have to be keep in the back of your mind as your body changes? Sometimes it can be frustrating working on the “basics” but it pays off later on. It sounds like you’re focusing on the right things when you’re in the water, nice job! I am not sure, I sink easier now than I used to. I also found swim caps effect the way my head sits in the water. No matter, its great to practice these things as its the fundamentals that make the big difference. BTW Love the stick figure drawings. I wonder if there are air bubbles inside your cap? Sometimes I play around with how much air is in my lungs when I float and it is a lot more challenging after I’ve completely exhaled. If I want it to be easy, I just hold my breathe and then breathe fast… lol – my stick men are awesome! Hahaha… the mental image of a person with a giant air bubble cap for a head keeps making me laugh. Some useful advice on floating, the most important skill in swimming. I like how you draw it! It is perfect! Thanks! Gotta work with what you have available 😉 Glad you like it. I have a problem if u could solve with ur tips . I am a beginner to swimming. I can float on my back and on my stomach too with holding my breath .Just started my class today i have problem when i front float and move my face out from the water and start breathing and kicking my legs and hips sink . What to do . Thank you for a very interesting post. I have tried this suggestion over and over many times but my feet and hips still sink. I am fairly muscular in the lower body so I will be trying another swim coach. My previous coach suggested I kick a bit more but at my age (56) this burns too much energy. Very frustrating particularly when I watch other swimmers which float and glide so smoothly !